I am bundled to the brim. Someone turn the sun back on please. Wool socks and long cashmere sweaters are nice, but I’d rather not be wearing them right now. I’d also rather not be drinking excessive amounts of coffee in an attempt to keep myself warm. This current cold snap sent me into a produce panic (likely induced by excessive caffeine consumption). I’m not ready for gratin dishes stuffed with root vegetables and bubbling cheeses. I’ll eat summer fruits and veggies by the bushel if it means postponing winter for just a little bit longer. That’s what I tried to do with this tart, stuff it with summer, but it’s a bit deceiving. 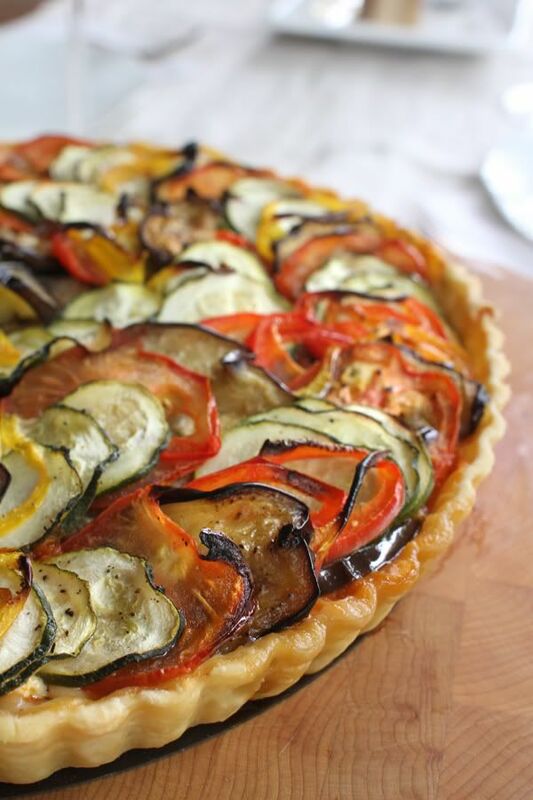 It’s overflowing with summer veggies and it’s colorful and cheerful yes, but those zucchini slices are sitting on top of a buttery crust and a warm ricotta under layer. Don’t get me wrong, I really did want to make a purely summer dish, but a cold salad just wasn’t going to cut it, I needed something warm and cozy and comforting. Simply put I needed winter to be disguised by summer. And it sort of worked, but I still want a bit more summer, or at least fall. It's Monday, which means this recipe is doubling as the 'Recipe of the Week' over at My Girlfriend Guide to Zürich. Last week I attended their Girls Night Out event at the Museüm fur Gestaltung (The Design Museum) where we were treated to a tour of the François Berthoud exhibit, given by François himself. A notable fashion illustrator (think Vogue, Channel, Dior, Cartier, etc) his works were provocative in their simplicity of color and form. Definitely worth a visit if you are in the Zürich area. 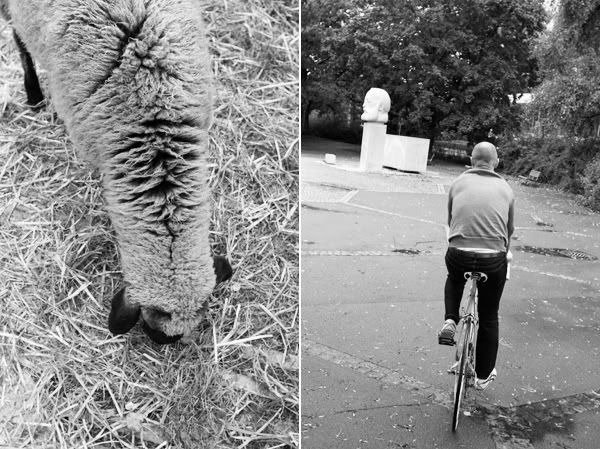 Winter is on it's way and these two pictures are proof. 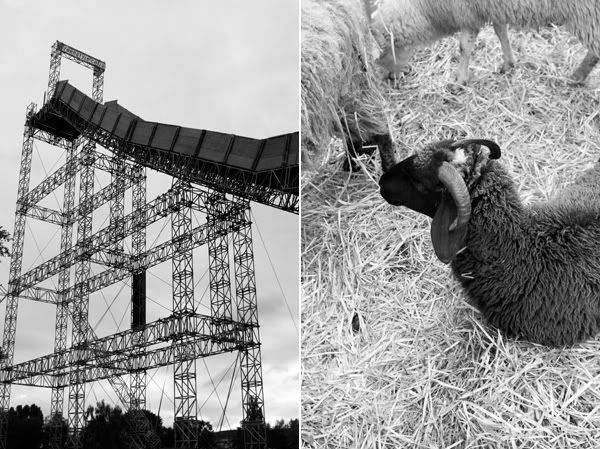 First there is the wool coat sitting and munching hay on the right and then there is the freestyle snowboarding run on the left. Well at least I think it's going to be for snowboarding. They've set it up right in the Wollishofen park down the lake from us. Yikes. I'll have to be sure to go check it out next weekend when the event is supposedly taking place. The dough is easier to make by hand than you might think. Combine butter, flour and a little bit of ice cold water and you have tart/pie dough. I rub the butter/flour between my fingers until there aren't any pieces of butter larger or thicker than a US quarter/Swiss Franc coin. 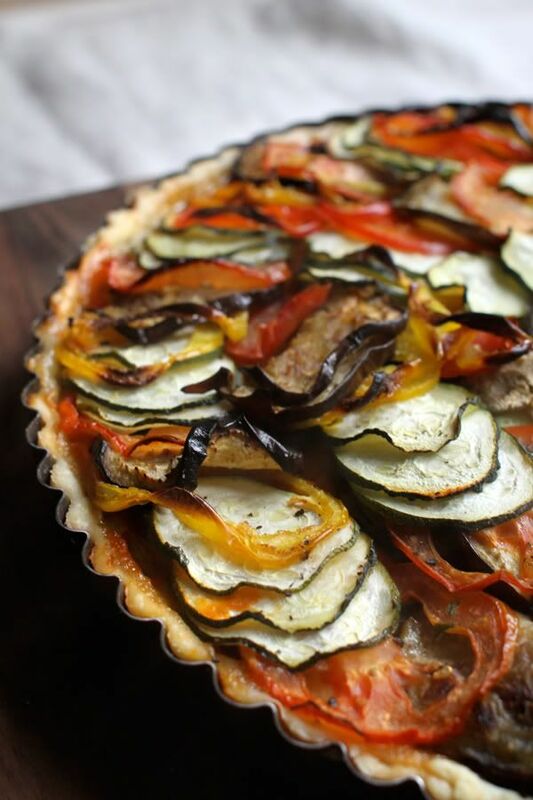 This ensures that the crust will be flakey and light. 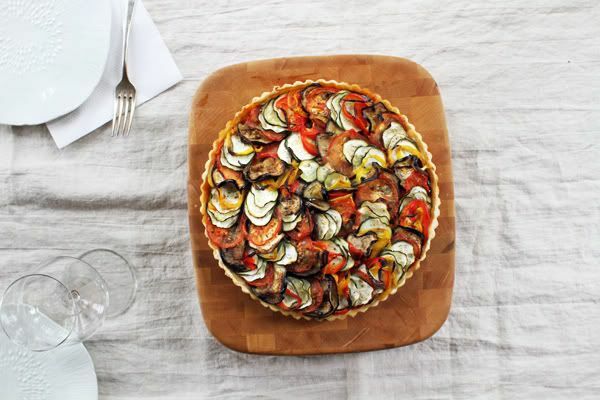 This tart is composed of a bunch of layers. First the onions, ricotta, tomato sauce, eggplants, and then the spiraling veggies, then a bit more eggplant and sauce and then more spiraling veggies. You can design it however you like, the end result is apt to be the same. 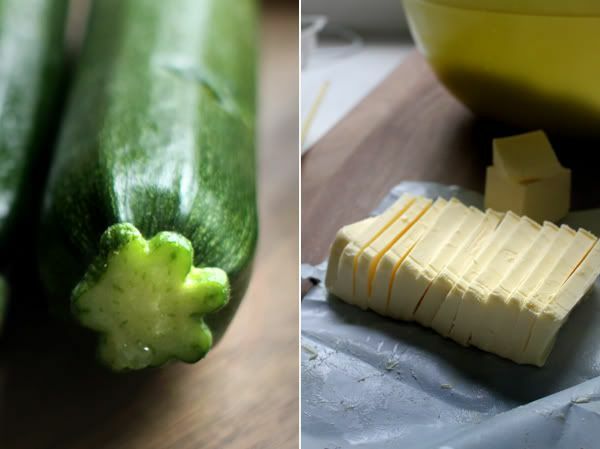 * cooks note. 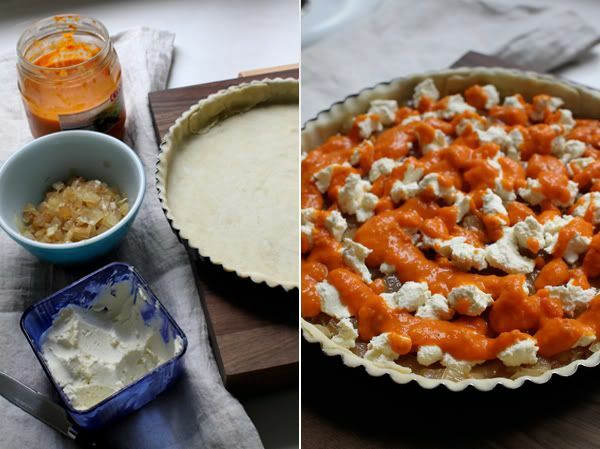 I used homemade ricotta and homemade sauce in this tart. I was inspired by this site and this post, which we've made twice this week already. 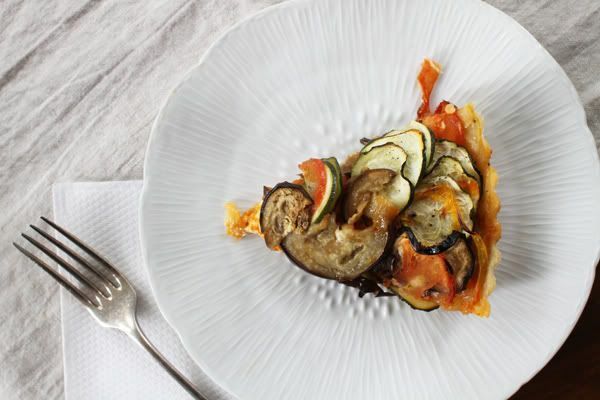 The remaining sauce and ricotta helped inspire this ratatouille tart. If you live in Switzerland and want to make your own ricotta email me because I went about it a round-about way, using muslin I found in the baby department of Manor, which necessitated a slightly different process, but with the same silky smooth cheesy outcome. tart dough - makes enough for 2 tarts, although you will only need enough for 1. 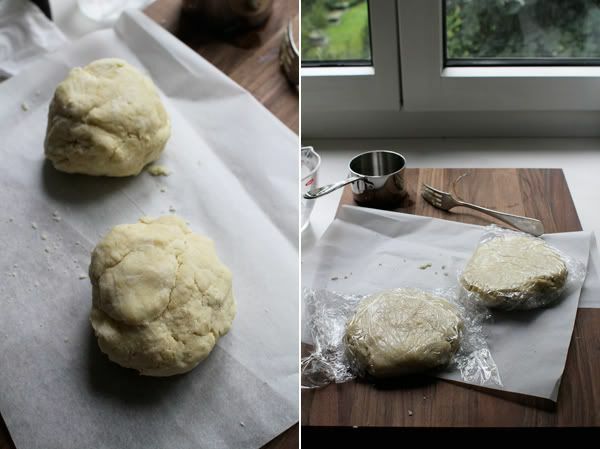 You can refrigerate or freeze the second dough ball, or halve the recipe. Stay tuned for an appearance of the second dough ball on house-to-haus soon. The eggplants take a bit of prep work so while the dough is cooling begin by slicing the eggplants into relatively thin slices, about 1/8” – ¼” (3mm-6mm). Lay the slices on a paper towel, sprinkle lightly with salt and allow to sit and ‘sweat’ for roughly 30min. Pat the slices dry with a towel. Heat 3 tablespoons of olive oil in a large skillet over medium heat. In batches cook the slices for roughly 2-3 minutes a side, adding more oil if you need it, and then place on a plate. While you are waiting for the eggplants to sweat you can cook the onions. Heat 2 tablespoons of olive oil in a skillet and add the onion, stirring occasionally until the onion is soft, juicy, and slightly tan in color, about 15 minutes. Place in a bowl and set aside. Slice the remaining vegetables about 1/8”/3mm. Lightly flour your work surface and with a rolling pin roll one of the dough discs into a rough circle about 1/8” / 3mm thick large enough to cover your tart pan. Don’t roll up and down, but rather roll out from the center, turning the dough every so often to ensure even thickness. 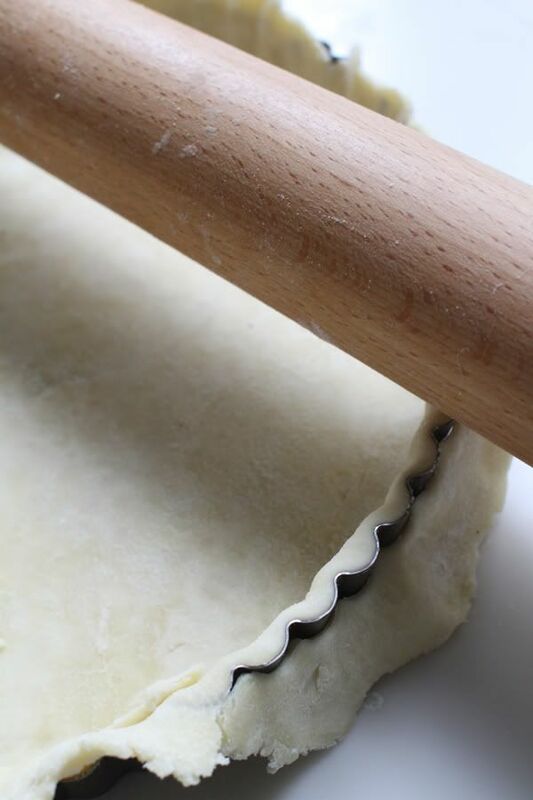 Place the dough in your butter-greased tart pan, smooth out around the edges and trim excess dough. Preheat oven to 375ºF/190ºC. Begin layering the veggie slices. Start with the onions, spreading them over the dough. Follow with the ricotta and then most of the tomato sauce. 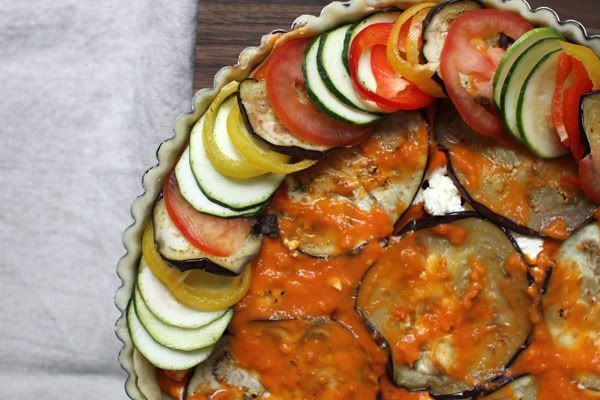 Place some of the larger eggplant slices, as many as will fit, on top of the tomato/ricotta/onion layers. Drizzle with the remaining tomato sauce. 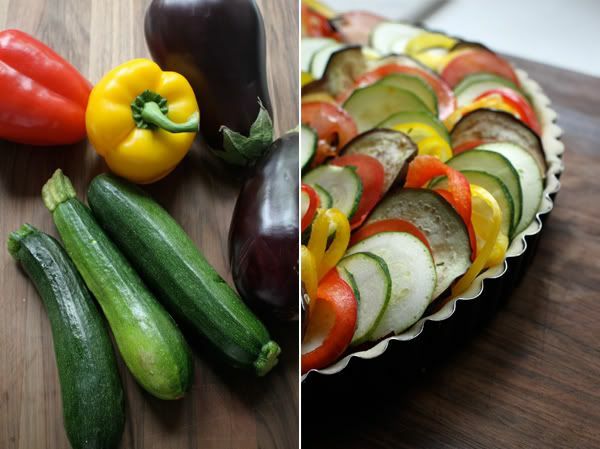 Starting from the outside begin to spiral the zucchini, pepper, eggplant and tomato slices in whatever order, fashion you please (I did 3 zucchini, then 2 pepper, 1 eggplant and 1 tomato, but really it’s up to you and what veggie you want to feature). 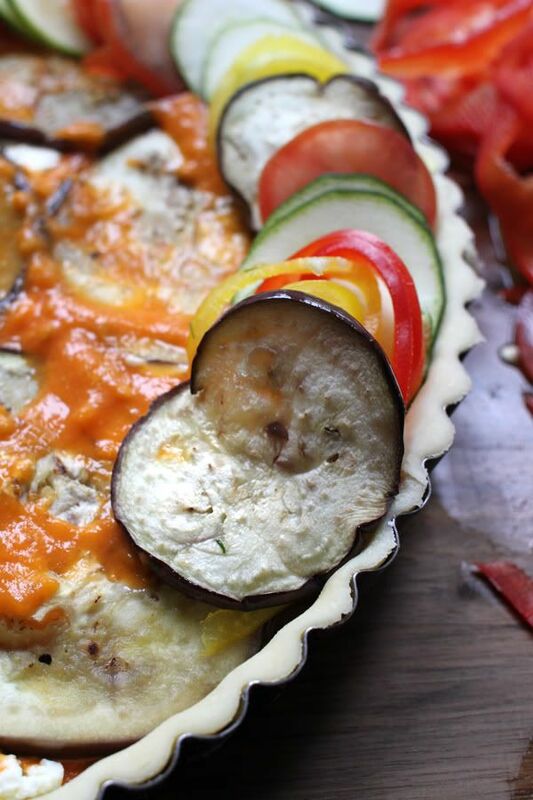 Before you continue to the inner spirals add 3 or 4 more of the larger eggplant slices in the middle. Continue spiraling until you reach the center. Sprinkle with salt, pepper and olive oil. Place in the oven and bake for 45-50 minutes. Let it cool a bit and then remove the tart plan. Best served warm. 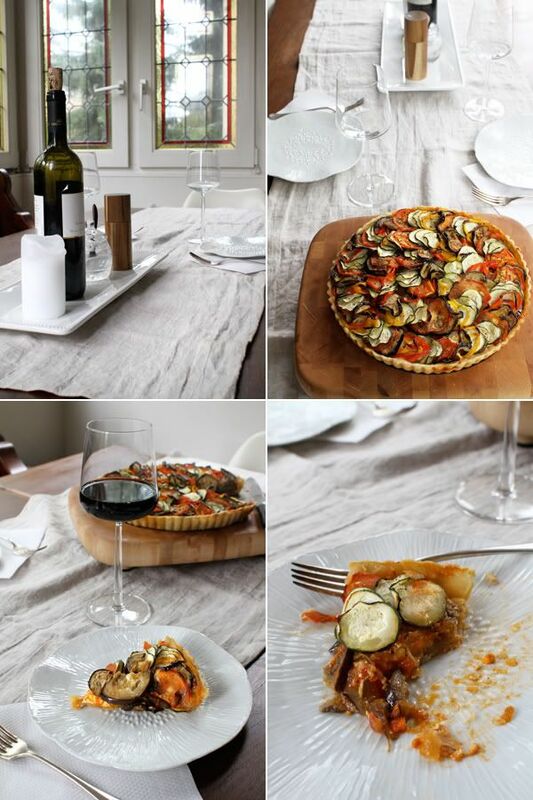 We ate the tart for lunch, hot out of the oven, and then we went for a bike ride. We came back with cold ears and fingers and so we ate another slice of tart, as a snack. And then feeling cozy and settled in the evening, unwilling to cook up something new, we ate another slice, or two, for dinner. It was the perfect food to have around on a cold day. 'We' went on a bike ride, which means I bought a bike! We went back to the flea market this weekend and I found a blue 1980s style cruiser bike. It doesn't have a basket yet, but I'm on a mission to find one. Okay time to reheat the tart for lunch! I'm hungry and cold. Stay warm Zürich readers! OMG DROOLING. Seriously. I want to come live with you. And what I really want to do is come play with you and Kerry! She is going to be in heaven with all of your cooking. I can't wait to hear/see/read all about it. Your photos are just stunning. Will def be making this soon! This looks incredible! 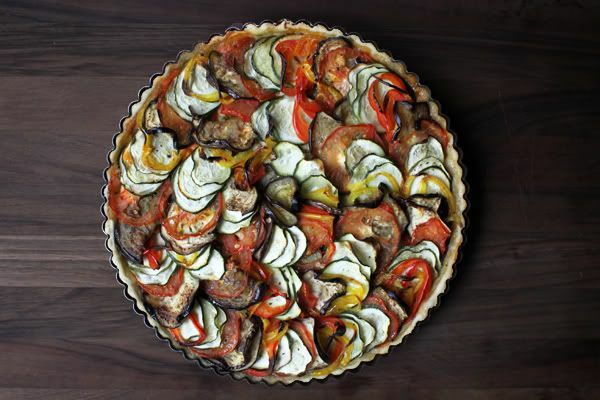 I've been meaning to make ratatouille but I wanted it to look similar to the dish from the Pixar movie. :) Yours looks so similar that I'll have to use this recipe eventually! I've clicked around your blog and love everything so far, especially your recipes. I'll be back! Ali! - Come visit ALL the time...and bring that little kitchen helper of yours! We need some more sticky gooey fingers around here. Can't wait for Ker to get here Thursday, it's going to be a cooking, chatting, walking weekend. Michelle! - hiiiii. Definitely give it a whirl. 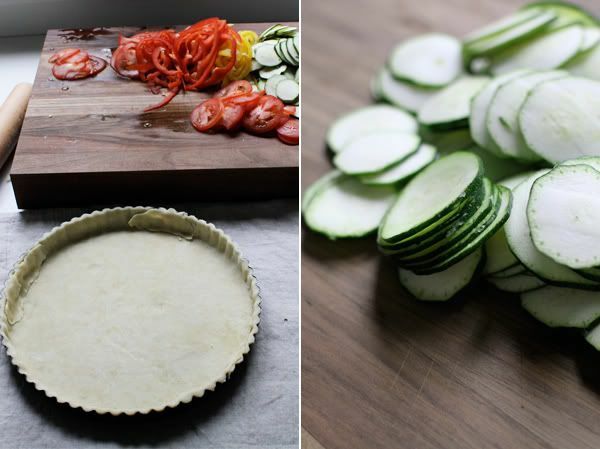 Hardest part is the crust, and that's not even hard. After that it's all design work...put those architect skills to work lady ;) hehe, hope all is well in TX. Miles is so cute I can barely stand it.